Media ignored economists in their reports leading up to the initiation of the economically damaging across-the-board spending cuts commonly known as sequestration. If Congress fails to act by midnight, across-the-board spending cuts of up to $85 billion in 2013 alone will take effect. While sequestration is inherently an economic issue, media are ignoring the last chance to have economists weigh in on the consequences. Media Matters reviewed news coverage leading up to the sequestration deadline, specifically the February 28 evening news broadcasts; March 1 reports from The Washington Post, Wall Street Journal, and New York Times; and the March 1 morning news programs on the major cable and broadcast networks. We found that economists have been almost completely shut out. Of 122 total guests and quoted figures appearing in a total of 43 articles or television segments, one lone economist was mentioned, Wells Fargo senior economist Mark Vitner in a report from the Journal. Conservative media are in the middle of a concerted push to claim that a government report confirms their longstanding claim that the federal government wastes tax money on employees whose sole duty is "union work," but ignore key content of the report in question that undermines their misleading narrative. Fox Business host Stuart Varney made that claim on the February 28 edition of Fox & Friends. But Varney's oversimplified version of the conservative case ignores the content of the report in question, and the more sophisticated version of the case made elsewhere falls apart under minimal scrutiny of the evidence these outlets offer. The report Varney cites from the Office of Personnel and Management directly contradicts his blanket assertion that this money goes to full-time union reps in the introduction. OPM explains that "voluntary membership in Federal sector unions results in considerable reliance by unions on the volunteer work of bargaining unit employees, rather than paid union business agents." In the next paragraph, OPM adds that these hours of pay go to "Federal employees performing representational work for a bargaining unit in lieu of their regularly assigned work. It allows unions to satisfy their duty of fair representation to members and non-members alike." Varney's presentation of this misinformation on a flagship Fox News program may prove an inflection point for a piece of misinformation that's percolated through other, smaller conservative media outlets since the OPM report came out in mid-February. On February 19, Fox Nation hyped a Washington Post story that noted some of the contextual information OPM provided. That same day, a Washington Examiner editorial writer highlighted the report. RedState.com put its own write-up on the front page on February 21, beneath an image of brass knuckles atop a pile of cash. On the February 27 edition of Your World with Neil Cavuto, Fox Business' Liz MacDonald made the same set of claims, and numerous other op-eds and blog posts from conservatives have accused the government of this same misspending of taxpayer dollars. Conservative gripes about "official time" expenditures are not new, however, as this 2011 Heritage Foundation testimony on the subject indicates. Many of these other instances cite Freedom of Information Act requests by the conservative Americans for Limited Government to back their claims. According to ALGFOIAFiles.com, the group requested information from four departments on employees who perform "official time" labor representation work full-time. All four -- the Environmental Protection Agency, National Labor Relations Board, Small Business Administration, and the Department of Transportation -- responded between September and November of 2012. While conservatives like Trey Kovacs, a labor analyst for the Competitive Enterprise Institute, point to the EPA (which found 17 full-time union reps) and DOT (which found 38) responses as proof of a widespread "problem" whereby taxpayers fund work that does not benefit them, the reality of these four FOIA responses is not nearly so convenient for conservatives. The data expose this claim for what it is: ideology masquerading as empiricism. As the table below shows, according to the most recent data available the four departments ALG successfully FOIA'd have as many as 0.19 percent of their employees doing union representation work full-time. And those employees do not account for all of the billed "official time" hours in any department, confirming that there are indeed many public servants (in the conservative sense of the phrase) who pitch in to bargaining and other representational efforts as needed. Conservative media voices have insisted that an increase of the federal minimum hourly wage from $7.25 to $9 would harm the economy. However, a wealth of economic evidence disputes the claims that minimum wage hikes are job killers, that the minimum wage is already high, and that it only applies to jobs held by relatively young workers. On MSNBC's Morning Joe, host Joe Scarborough continued to harp on Medicare and deficit spending as a pressing economic problem and twice claimed that "liberals are denying math" to avoid tackling the issue. However, economists widely disagree with that assessment, suggesting that it is Scarborough, not liberals, who has a weak understanding of math. On the February 12 edition of Morning Joe, Scarborough, who has previously hit Paul Krugman on his view of long-term debt and attempted to discredit the Nobel Prize winning economist for defending Medicare, claimed that "liberals should want to reform middle class entitlements" so as to not "steal from welfare programs...for the poorest Americans." Scarborough's attempt to paint Medicare as one of America's most pressing issues completely misses the point behind its current problems. Former Labor Secretary Robert Reich points out that Medicare, rather than being the "problem," is actually to solution to the real issue -- rising health care costs. Dean Baker, co-director of the Center for Economic and Policy Research, even goes as far as to say that Medicare is "by far the most efficient part of the national healthcare system." Indeed, evidence suggests that Medicare provides a more economically viable delivery system for healthcare. According to both the Center on Budget and Policy Priorities and the Economic Policy Institute, Medicare is better than the private sector at controlling costs, and projections of future cost growth in public health care programs are lower than those for private sector. Furthermore, many economists, including Reich and Nobel Prize winner Paul Krugman, note that Medicare can use its bargaining leverage to negotiate prices of medical procedures and prescription drugs. In fact, according to economist Jared Bernstein, provisions in the Affordable Care Act -- many of which have not yet been implemented -- will help control costs of healthcare, brightening the prospects for sustainable Medicare. In addition to being wrong on Medicare, Scarborough claimed that those who disagree with him on today's deficits amount to just a few "bloggers eating Cheetos," implying that the majority opinion is on his side and that "the American people know" he's right about spending. Scarborough displayed the same willful ignorance of economic discourse in his January Politico op-ed, "Paul Krugman vs. the world." Economists like Mark Thoma, Brad DeLong, Jared Bernstein, Dean Baker, Henry Aaron, Alan Blinder and Larry Summers agree that deficits are not worthy of concern, so long as economic output lags behind its potential, as do former Reagan adviser Bruce Bartlett and John Makin of the conservative American Enterprise Institute. Business Insider's Joe Weisenthal lists a few others. The simplest math is this: at least 15 experts, including 13 economists, a congressman, and a Reagan budget adviser, reject Scarborough's argument. The Congressional Budget Office's new baseline projections back Krugman as well: The CBO found that the sharp rise in debt-to-GDP that Scarborough laments has stopped, and that the ratio of public debt to economic output will hold at or near its current level for the next decade. Further, the report notes a trillion-dollar gap between actual and potential economic output. The CBO doesn't explicitly state policy recommendations, but Rex Nutting of the Wall Street Journal's MarketWatch noted that the report amounts to a call for four more years of high deficits. This wealth of professional economists and empirical facts may explain an apparent shift in Scarborough's argument from the February 12 segment, in which he said even Krugman's supporters "agree with me that deficits aren't the problem, the long-term debt is the problem." If Scarborough believes that deficits aren't a problem, then what does he think he and the entire mainstream of the economics profession are arguing about? Throughout the recent weeks' debate, Scarborough has attacked deficits, and conflated them with the long-term debt. He blamed "a Keynesian spending spree" for slowed economic growth in late 2012, and bragged in Politico of his sterling deficit-hawk track record dating back to 1994. It is true that the economists making the textbook argument for running deficits today also note that deficits will need to be controlled in the medium-near future. Jared Bernstein refers to this conceptual balance as being a CDSH: a cyclical dove and a structural hawk. Is Scarborough now looking to join that club, by declaring support for near-term deficits coupled with restraint in the middle distance? If so, Krugman, and his fellow "math-challenged" supporters, would be justified in declaring victory. After months of economic coverage narrowly focused on deficits, a new jobs report from the Bureau of Labor Statistics reinforces the need for the media conversation to shift toward growth. The alternative approach would require journalists and pundits to follow in the footsteps Rush Limbaugh laid out today when he insisted the BLS report says the opposite of what it does. Of course, Limbaugh has it exactly backwards. The BLS report on January job growth contains the official benchmark revisions to monthly data from as far back as 2008. The BLS figures had previously shown that the private sector gained 4.1 million net jobs as the government slashed payrolls by 645,000 from mid-2009 through the end of 2012. The new numbers show an even broader divergence. The private economy has added 4,968,000 net jobs since the economy began growing again, and the public sector has lost a net 721,000 workers in that same period. These numbers demonstrate that government austerity has lopped nearly 15 percent off private-sector job growth over the course of the recovery. The news comes on the heels of the Bureau of Economic Analysis' report that a collapse in government consumption helped put the economy into reverse last quarter, despite strengthening private-sector components of GDP. On his blog, Nobel Prize-winning economist Paul Krugman notes that President George W. Bush's recovery benefited from steadily increasing government consumption. But with the Tea Party movement and the attendant focus from conservatives on reducing deficits, President Obama's recovery has been hampered by steadily falling public-sector consumption for the past two years. Even without growing government's direct contributions to demand -- just by keeping them flat for the past two years -- the economic recovery would look much stronger. America would be hitting a recovery milestone, with 5,000,000 new jobs since the recession ended, if not for the deficit hawks. Their success in pushing austerity prematurely into the policymaking conversation has cost even more public-sector jobs than previously thought, while private-sector growth has been much more robust. The decision by television news producers to rely on political guests and reporter-pundits in their coverage of the recent debt ceiling dispute not only pulled focus away from economic reality, it also gave TV media influencers room to reinforce a key falsehood about the nature of our deficits. A Media Matters study of 273 cable news segments on the debt ceiling found 55 segments attributing deficits primarily to entitlement program spending, compared to just four segments acknowledging that rising health care costs and the economic collapse are to blame. Economists are clear about the primary sources of recent deficits -- on top of the Bush tax cuts, the Great Recession triggered massively higher counter-cyclical spending, some of which was automatic for things like jobless benefits and food stamps, and some spending that was newly enacted to buoy a collapsing economy. Middle- and long-term deficit projections are more controversial, but many economists argue that once economic growth catches up to its potential, our fiscal health will depend almost entirely on our ability to control health care costs. 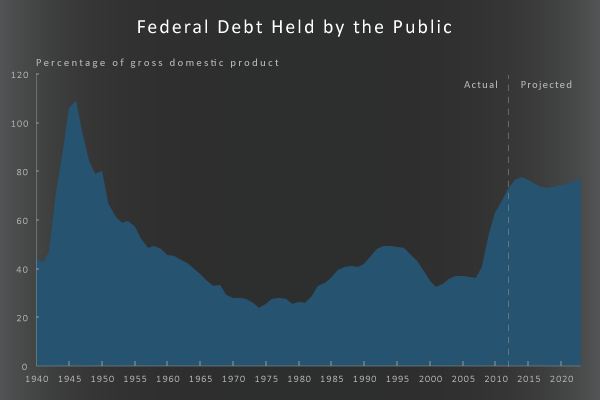 This mainstream economist perspective appeared in just 1.4 percent of the debt ceiling segments Media Matters reviewed from a three week period, while over 20 percent of those segments blamed entitlements for the fiscal gloom. The tendency by the most conservative networks to focus on entitlement spending is telling in light of the right's claims about a struggle between "takers" and "makers." For conservative outlets and their mainstream enablers, each successive skirmish over spending and debt is an opportunity to re-focus the conversation on the supposed need to cut entitlement spending. If economic experts were included in that cable news conversation, they could reveal some key data. For example, conservative proposals for Medicare would likely accelerate the growth of health care costs; minute changes to the payroll tax system could make Social Security solvent for 70 years; and "entitlement" programs spur economic growth for everyone. In recent weeks, media outlets have focused heavily on negotiations regarding raising the debt ceiling. But television news has failed to highlight the pressing need for stronger economic growth. Furthermore, discussions about the debt ceiling often ignore facts about deficits, instead pivoting the focus to entitlements as a driver of deficits.